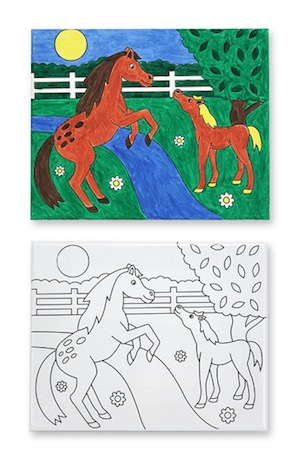 Young artists will love this beautiful, ready-to-paint scene of a horse and colt in a summer meadow. A paintbrush and a mixing tray are included, along with six bright colors of paint to adorn the preprinted canvas. Dimensions: 8" x 15.75" x 1" Assembled. Recommended Ages: 4+ years. Contains small parts.